Many bloggers take December 31 each year to do a recap of their year in blogging. Google is no exception. The multi-billion dollar company has a post today patting itself on the back for a solid five years worth of blogging. More notably, they talk about how the amount they’re blogging has increased significantly over the years. 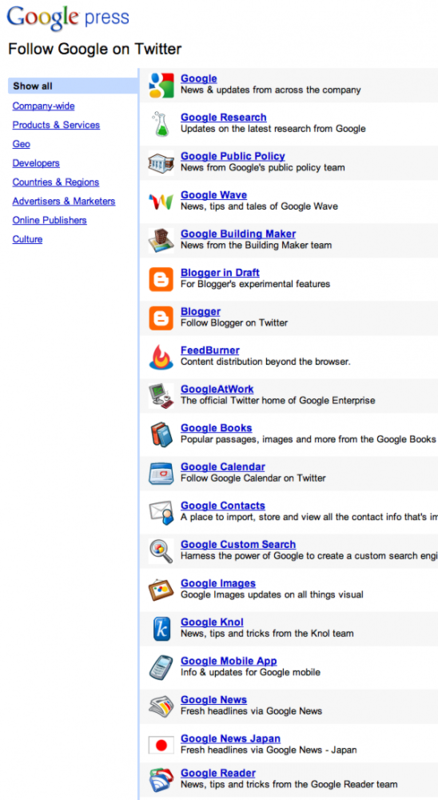 In 2009, Google had 423 posts on the Google Blog, which is just one of dozens of blogs they run. That represents a 15 percent increase over 2008. They also note that just about 14.5 million people stopped by the blog this year, which is a 21 percent increase over the previous year. Make no mistake: Google is taking its blogging very seriously. Google also takes the time to note how committed they are to using Twitter . Since starting to tweet in February, Google has sent over 1,000 messages (almost all of which are self-promoting, like any good Twitter user). And while their account isn’t quite as popular as Lady Gaga’s (something which they bemoan), they do have about 2 million followers of their main account now. Oh, and they’ve set up some 75 other Twitter accounts for their various properties (they actually have a directory) — something which we poked fun at in July. Even CEO Eric Schmidt finally joined up. But perhaps the most interesting stat that Google shares is that Twitter was the biggest non-Google referrer to its blog in 2009. Google notes that this is “a clear sign of its rapid growth in popularity.” That’s a nice big wet kiss to a company it was supposedly in talks about acquiring earlier this year. Something else I’ve noticed about Google’s 2009 in blogging is that they’re actually getting better at it. It used to be that we would summarize company blog posts (which, naturally, I’m doing here) because they were awful at getting their point across. Or, as a colleague of mine who shall remain unnamed put it, “thanks for five years of cheesy headlines, meandering and grandiose ledes, and self-serving misinformation about openness.” But this year, it seems that Google (and a number of other companies) are getting better at using these in-house blog posts to announce things. And I’m all for that. Not having to re-explain something that’s already out there frees us up to do better posts as well, such as deeper analysis about what the companies are announcing. That said, the point about Google’s self-serving posts remains an issue as we saw very recently. But not to worry, we’ll still be here to call BS on those posts when we see them.